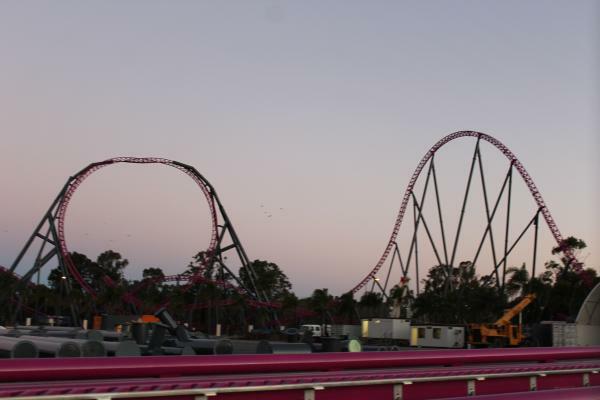 Warner Bros. Movie World has announced what they’re calling a “game changer” for Australian theme parks by officially unveiling the DC Rivals HyperCoaster. The Gold Coast theme park is billing the ride as the tallest, longest and fastest HyperCoaster of its kind in the Southern Hemisphere. Read more from Gold Coast Bulletin. This is the first hyper to feature reverse seating, correct? Video seems to show the back row only facing backwards...only time I recall riding something like that was the long-defunct (and terribly misnamed) XLR-8 at AstroWorld. I has a non-inverting loop and that is not it's first element, looks like an impressive coaster. Mix of forward/backward seating on the same train, yes. Backward Hypercoaster? No. Bandit at Yomiuriland in Japan, the Togo Hypercoaster that inspired Magnum, ran at least once a backward train. The park is quite imaginative with its promotions around it like adding flamethrowers or water cannons at the bottom of the first drop and I read once they ran a train backward on it. The second one is also in Japan and its Hollywood Dream: The Ride at Universal Studios Japan. It originally opened with 5 forward facing B&M Hyper Coaster trains and a few years ago, they modified one or two trains to run backward. So yes, imagine this: they run both forward and backward trains on the same coaster and they load using a double station like the B&M Flying Coaster or Big Thunder Mountain. One unfortunately side effect of that is that to keep the original capacity of 9 cars per train, the backward train restraint release is now mechanical. This mean that the standard B&M lap bar sensors were deactivated and they go by a not very forgiving sticker at the bottom of the lap bar. To give you an idea, each train had 1-2 riders kicked off for not fitting. When buying Universal Express passes, the regular pass for Hollywood Dream only give access to the forward trains. To ride the "Backdrop" side, you need to book a specific booklet. There is also separate stand-by lines for each direction. Looks amazing. Hope the us gets a Mack hyper some day. I start twitching every time I see a coaster video with cuts between medium/POV shots and close-up/aerial shots.